Happy Friyay Bookstaverse!!! I recently began a reread of The Hunger Games. By this point, pretty much the entire globe has either read the books, watched the movies, or both. I read the series for the first time not long after it was published and really enjoyed all of the movies. By far one of the best adaptations from book-to-screen for a series I have ever seen. I wanted to reread them in order to refresh my memory as to how close the movies actually are to the books. I am about a quarter of the way into the first book and it is blowing my mind all over again! 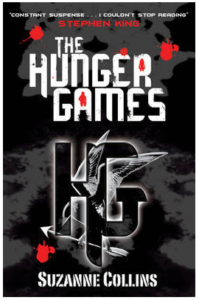 The introduction to the country of Panem, the way it is all controlled by the capital and meeting our kickass warrior princess, Katniss Everdeen (that’s how I think of her anyway) – it is just a delicious reading experience. I think we all take for granted now how cutting edge this story truly was when it was published in 2008. It was unique and grabbed people’s hearts and minds, young and old alike. My favorite aspect of the stories is the competition. I love stories that have some sort of competition (hency why Harry Potter and the Goblet of Fire is my favorite in the series); newer examples of this would be Throne of Glass or Warcross. There is something about it that just makes a story seem that much more harrowing; your favorite hero or heroine on the brink of losing or worse losing their lives in some sort of action-packed death match! One thing I had forgotten since my first read was the strain in the relationship between Peeta and Katniss going into the Games. I had forgotten they were not really friends in the beginning and that Katniss feared early on that Peeta had betrayed her to the career tributes. Reading it again, all I can picture is Jennifer Lawrence and Josh Hutcherson (and of course Liam Hemsworth, Woody Harrelson and Elizabeth Banks) – they did a really exceptional job casting the movies. What are your favorite book-to-screen adaptations? I’d love to hear if you thought that they did The Hunger Games well or did you expect more?